Funny Elephant enjoying his favorite bowl of noodles! 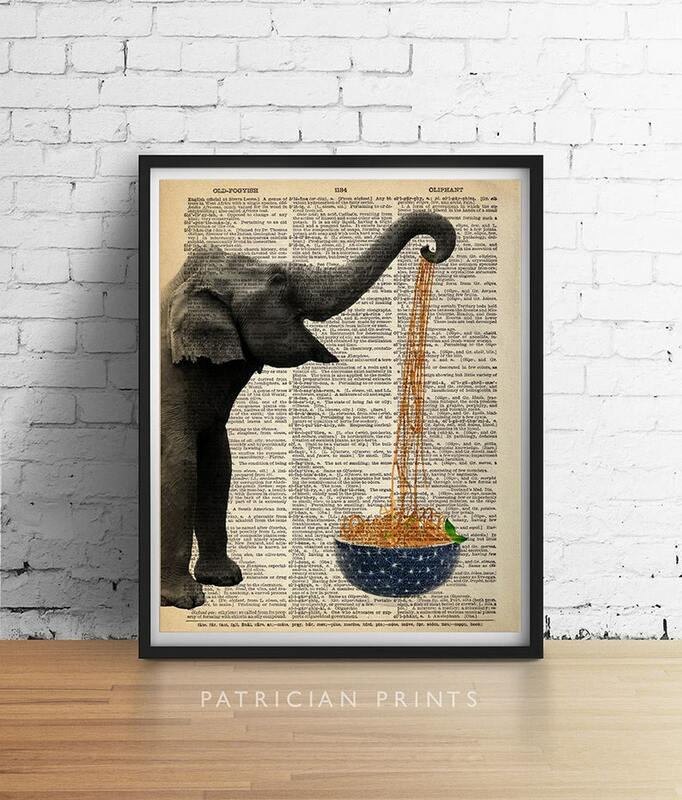 A high quality giclee of my original digital montage over a special antique 3 column 1930's English dictionary page. Indexed words are "Old Fogyish" and "Oliphant (an Elephant)", with many great words in between like "old school, oleraceous (pot herbs for cookery), olfactory", etc. Makes a great read! Our museum-quality posters make a statement in any room. • All size prints (except for 5x7") are carefully rolled and securely packaged in rigid tubes. This minimizes movement and prevents bending during transit. • 5x7" prints are shipped flat in a clear cello sleeve sandwiched between cardboard. • Rest easy knowing your artwork will arrive safe and sound! Each print is professionally and freshly made just for you. Please allow 2-6 business days for production and printing, prior to shipment. It’s beautiful and exactly what I wanted. Shipping was also super fast. I love it so much! Great quality, beautiful print - my sister loved it! Can I request a dictionary page with specific words on it? — Sorry, we cannot customize the background page. There are thousands of book pages to sort through (many out of alphabetical order) and it takes considerable time to find just the right one. We always strive for interesting, fun word/ image association! Does this include a matte or frame? We do not offer framing services. All of our prints are standard sizes so frames are easy to acquire at art and craft stores, IKEA, Home Goods, etc. Shipments outside of the USA may incur customs fees depending on the destination country. The fee may vary depending on your order value, country limits, and other factors based on the product itself. Buyers are responsible for any customs and import taxes that may apply.